« * WINNER of the Sunglass Warehouse Giveaway * BuddyCO is Living the Life of Riley! Every new mom worries about EVERY thing regarding their baby. I constantly want to make sure that I am doing my absolute best by my daughter. I also happen to be extremely concerned with the state of our environment and try to be a smart, environmentally conscious consumer too. 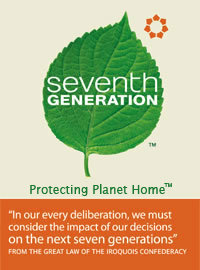 Thankfully, Seventh Generation is a company that takes those same goals to heart. They have created an entire line of completely natural products to be used in our homes, that are also good for the environment and for our loved ones. I was very excited to review the Natural Baby Starter Kit from Seventh Generation! Since there were so many great baby and household products included in the Natural Baby Starter Kit, I thought the easiest thing to do was to first give you a brief description of each product and then tell you my experiences with them. First, the Seventh Generation Recycled Bag is a nice, sturdy, black shopper bag with the Seventh Generation logo on the front. It looks pretty much like most other shopper bags you see. I received the unwhitened variety and they were just as absorbent as my regular paper towels. I couldn't tell a difference from my old brand on how well they performed. These baby wipes were completely unscented. They felt softer than the baby wipes I currently use, though not as damp. They still performed just as well as my current baby wipes, though. Since Riley has skin that is sometimes sensitive and breaks out for unexplained reasons, I'm happy that these wipes were completely hypoallergenic. 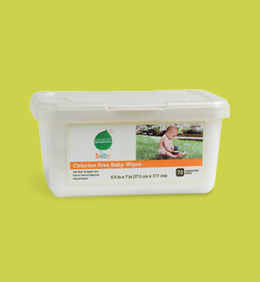 This is one of my favorite products, because as any mother knows, children LOVE to put EVERYTHING in their mouths! I think they go through this stage for almost two full years! 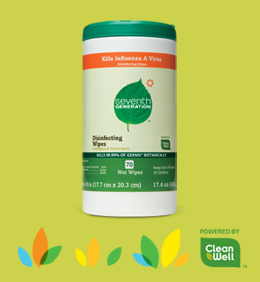 This all-natural disinfectant is perfect for spraying Riley's toys down to make sure they stay sanitary. This bathroom disinfectant will be heavily used when Riley begins potty training. I've tried it out and have to admit that it works just as well as my other bathroom surface cleaners, but with absolutely NO SMELL! I use these primarily in the kitchen. They're great for a quick wipe down of your counters after cooking eggs, chicken, pork, etc. I also like using these to wipe down the microwave and refrigerator handles, especially during cold and flu season! This is a great product to use for wet mopping your tile or linoleum floors. 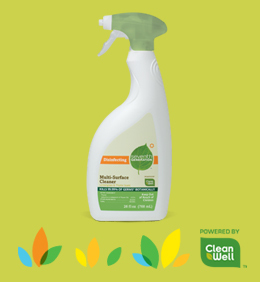 In my opinion, this cleaner is essential for anyone with a very young child, because the floor is where they spend a lot of their time at this age! 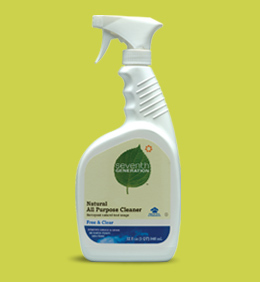 This all-natural cleaner doesn't have the harsh fumes that other cleaners do and it's completely safe for a crawling baby to get on their hands and then put those hands in their mouth. This is the only product that I'm not completely thrilled with and it's for very ridiculous reasons. 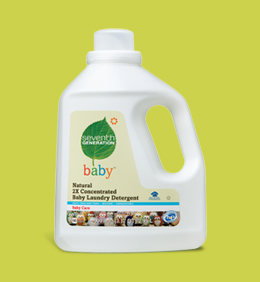 I've used baby detergent, like Dreft, in the past and it always SMELLS so good! Whenever I cuddle with my little one, I love smelling her blanket and pajamas! Seventh Generation has removed all of the perfumes and dyes, which can irritate babies sensitive skin, but doing so has also removed the wonderful smell too, which I love! Riley has been known to break out on her rear-end for no known reason. This is why I am so happy that Seventh Generation has made a diaper that is completely hypoallergenic and contains no fragrances or latex. 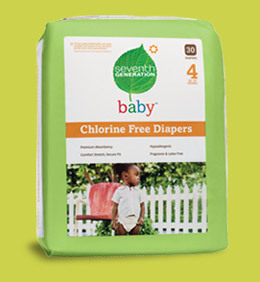 These diapers fit great and I couldn't tell a difference at all in either fit or absorbency from the ones we currently use. My husband says that he's not a fan of the natural coloring of the diaper though, for it looks like its already been used! 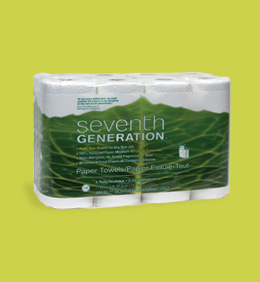 There are a ton of environmental reasons for using Seventh Generation products in your home and now, after trying all of them out personally, I'm sold! I think that it is great to know that these all natural, non-toxic products are what my daughter will be around when playing and putting things in her mouth. I can't believe that I was able to get all of these wonderful products for virtually the same amount of money that I would pay for the chemical-ridden, environmentally detrimental ones. The only one of these products that I probably wouldn't buy is the baby detergent, simply because it doesn't have any smell and I really love the smell of baby detergent. I'm so glad that there is a company out there like Seventh Generation who is making healthy alternatives that are also good for the environment. Disclosure: I received the Natural Baby Starter Kit from Seventh Generation in order to facilitate my review. No other compensation was received. This product review is based on my own personal experiences with this item and is completely honest and objective.